Programmers (and often testers) should form the largest group, without programmers there is no software, and while in an ideal world there is no need for testers the reality is the absence of testers is usually a sign of problems, though not always, I’m not the only person to have observed high performing development teams where there are no testers but these are the exception. Although you occasionally here stories of IBM or Microsoft employing more testers than programmers I’ve never seen this situation the nearest I’ve come to it is teams with 1 tester for every 2 programmers. 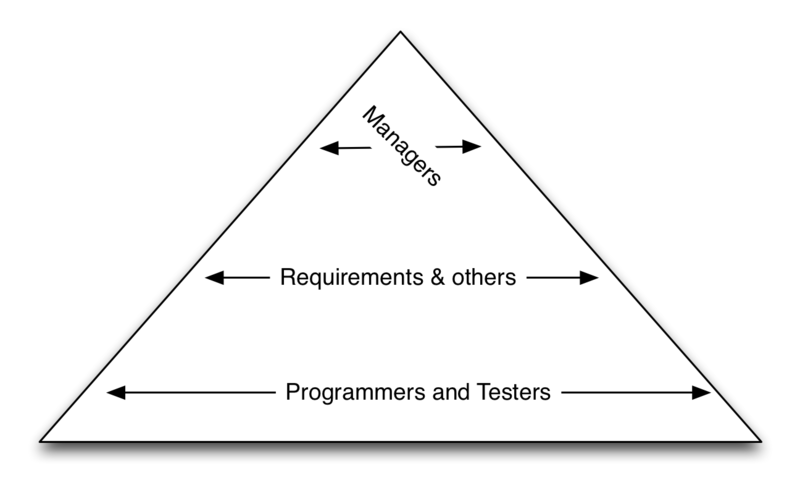 The number of testers to programmers should be a function of the initial quality produced by programmers but it more often than not a function of how seriously management takes testing and the regulatory environment the company operates in. Anyway, programmers - the people who produce the raw produce, source code, should be the largest group. Testers are a little way behind but together these two groups should form the bulk of the development team. After this I expect to see some requirements people (Business Analysts, Product Managers, Product Owners, Requirements Engineers, what ever titles they go by.) There may be some other people in this mix: customers, business sponsors and so on. On top of this there are a few management types, whether these be project managers, development managers or some other type of manager is not important. I know some people want to remove all managers, I don’t agree with them but I do agree there shouldn’t be many. 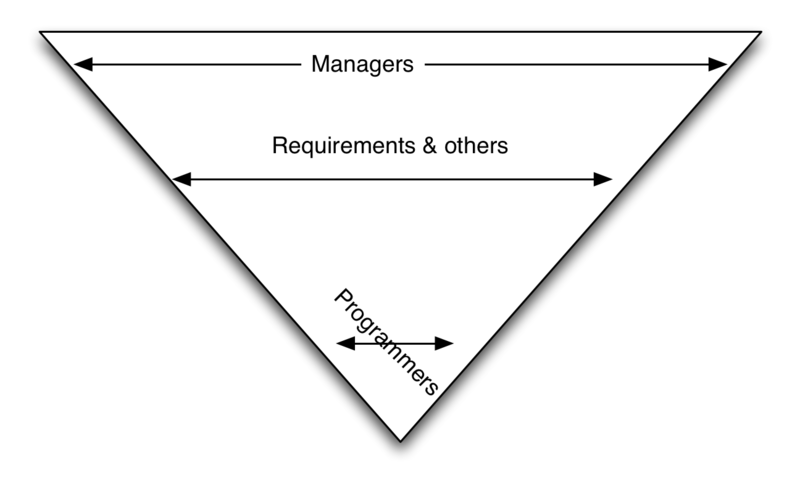 In a healthy team there are lots of doers (programmers, testers, UXD), fewer people feeding these people (requirements) and even fewer people managing everything. Requirements people and managers act as a multiplier to programmers (doers), these guys lay the golden eggs, by organizing them well, and asking them for the right golden eggs the value of the golden eggs should be higher. By the way, when I talk of people I’m thinking absolute numbers, not “full time equivalents” or even “full time dedicated staff”; the people higher up the pyramid may well be multi-tasking. Whats important here is not the time devoted to a piece of work buy the number of voices who have a say in what happens, the number of people who have a finger in the pie. So part time people, those with dotted lines, those with responsibility and concern but no responsibility, they all count in the pyramid numbers. Periodically I meet companies who have an inverted pyramid: this is almost always a bad thing, a really bad thing. In the extreme there is one programmer at the bottom, no testers, and lots of people who have an interest in what is being created. Lots of people who have views - they have Product Owners AND Product Managers AND Business Analysts AND Subject Matter Experts AND Business Partners AND Requirements Experts, Project Managers AND Development Manages AND (maybe) Team Leads. Many of these people who have a finger in the pie of “what is built” are part time to the work, they have the right to interfere but no responsibility for what happens. Work takes years to get started and never seems to finish - perhaps the developers are split between projects.